Yorkville Sound is introducing three new passive loudspeakers to the Elite family. The EF10, EF12 and EF15 will debut at the 2019 NAMM show. 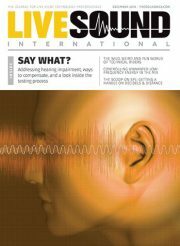 “A lot of our customers were looking for Elite level performance in a passive speaker for installations and venues with existing power amps,” says Jeff Cowling, Yorkville sound’s VP of sales and marketing. Based on the market success and positive user reaction to the Elite powered cabinets (released in 2017), introducing passive versions of the EF10P, EF12P and EF15P is the next logical next step.